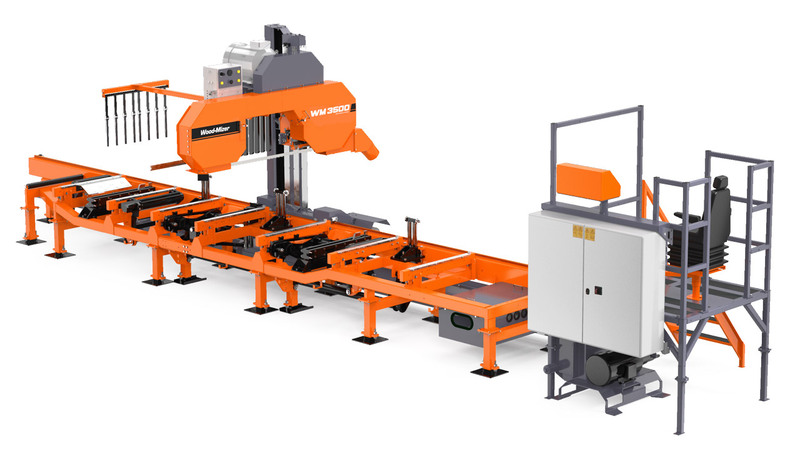 The WM3500 is a proven industrial thin-kerf sawmill for primary log breakdown, and for cutting logs which cannot be processed in an automated line. The WM3500 delivers higher log yield at lower investment and operating cost than alternatives, increasing profitability and ability to produce diverse products quickly. The WM3500 requires only one operator to manage log handling, sawing, and remove finished boards for further processing. Powerful computer setworks, centralised controls, and heavy-duty hydraulic functions enable the operator to focus on producing quality timber at a high production rate. The WM3500’s wide throat capacity cuts large diameter logs into boards or cants with help from the bidirectional chain turner, hydraulic toeboards, and heavy-duty log clamp. The WM3500 uses thin-kerf, narrow band blades that maximise log yield and minimise waste and operational costs – increasing profits and competitiveness. Operator has full control with automation functions that increase productivity. Integrated blade lubrication ports, flanged, heat-treated rollers with high speed bearings, and double block guides. Standard raised platform gives operator clear view of work. Optional enclosure. The versatile log clamp can be used to clamp the log or cant, as well to flip cants precisely. Quickly turn and position the log with the heavy-duty turner. Position the log on the sawing bed and remove cants quickly. SIA Planka converts from equipment requiring all manual log handling to semi-automatic sawmilling lines in less than a decade.